The “War of Independence” between the dates of November 1947 to July 1949 – This war began with six months of civil war between the Israeli and the Arab militias during the waning hours of the British Mandate of Palestine. After the Declaration of Independence May 15, 1948, five Arab nations attacked Israel and were defeated. Here, the 1949 Armistice Agreement stipulated the lines of the armistice that would exist between Israel and the West Bank that isknown today as the Green Line. The “Sinai War” of October 1956 – On July 26, 1956, the Nation of Egypt announced its intentions to nationalize the Suez Canal. The counter force was Britain, France and Israel who attacked Egypt for the purpose to capture and take the Sinai Peninsula, and to gain international control and supervision of the Suez Canal. Egypt withdrew her forces with the bonus of Britain and American funding of theAswan Dam. The “Six-Day War” in June 1967 - Israel was attacked by three primary Islamic States, Egypt, Jordan, and Syria and four secondary nations; Iraq, Saudi Arabia, Kuwait, and Algeria. A large part of the region of Shomron and Judea was captured and returned under Israeli control, the territorial gains by Israel, called the Purple Line included; Shomron and Judea in the “West Bank” (occupied by Jordan), the Golan Heights (occupied by Syria), and Sinai plus Gaza (occupied by Egypt). The “Egyptian War of Attrition” (1968-1970 – This limited war started by Egypt with its bid to recapture the Sinai Peninsula. It also included the forces of the USSR and the PLO (Palestinian Liberation Organization. Hostilities were terminated with no change in the borders in a ceasefire in 1970. The “Yom Kippur War” in October 1973 – This Arab incited war was led by Egypt and, Syria in the bid to reclaim the land lost to Israel in 1967. It began on the surprise attack of Egypt and Syria on the Israeli High Holiday of Yom Kippur. Arab forces were defeated and the territorial lines were not changed. The “First Lebanon War” of 1982 – The trigger for this was the attempted assignation attempt on the Israeli Ambassador to Great Britain, Shlomo Argov by the Abu Nidal Organization. This led to continuous terrorist attacks against the Northern Borders of Israel that precipitated the Invasion of Lebanon by the Israeli Defense Forces, in their attempt to expel the Palestinian Liberation Organization. It led to the eventual withdrawal of Israeli troops back across on their borders but no border lines were ever changed. The “Second Lebanon War” (Hizballah and Israel) of 2006 – With the commando assault by Hizbullah and abduction of two Israeli reserve soldiers that started on July 12, 2006 and continued until the Vatican inspired Rome Peace Accord, went into effect on August 14, 2006, and formally ended on September 8, 2006 when theIsraeli Naval blockade on Lebanon was lifted. The “First Palestinian Intifada” started in 1987 and ended in 1993 – This Palestinian uprising started in the Jabalia Refugee Camp and quickly spread quickly across Gaza, Samaria and Judea and into Eastern sector of Jerusalem. The “Second Palestinian Intifada”, called the Al-Aqsa Intifada started just prior to Rosh Hoshana 2000 when Prime Minister elect Ariel Sharon went up on the Temple Mount and there prayed while reading Ezekiel 38-9 (GogUMogog). The intifada essentially ceased to exist when Yasser Arafat died in 2004. Today, Israel is back to the drawing board. Again the Arab nations that surround her are rebuilding their armament to the degree never seen against Israel since the walls of Jerusalem were surrounding by the forces of Rome in 68-70 CE. Yet, the threat against Israel is not only localized but also regionalized. As the nations surrounding Israel, the Israeli mental concentration for defense only intensifies. As a nation, Israel alone, in all her 62 years of existence, has only considered her nation to be in a permanent state of war survival. It excels in military and technological intelligence capacities, that are the cutting edge of world excellence and achievement. If there was a nation that could produce a “shock and awe” military confrontation, it would be Israel. Scheduled for deployment in November, 2010, the Rafael manufactured “Iron Dome” interceptor, has been coordinating with the air defense system and now has successfully shown her ability to shoot down a number of airborne “threats” while working in full operational mode, thus replicating incoming missiles from the Gaza Strip and Lebanon. This mobile defense system was developed to counter short range rockets 155 mm artillery shell threat. It will be useful to use in ranges up to 70 km. in all weather conditions. These defense systems are expected to be highly useful against the Hamas Gaza missiles that have produced daily a barrage of missiles on Israeli cities. It was in 2006, in the Second Lebanon War that tens of thousands of missiles were shot against Northern Israel and today, there, the Hizballah militia forces, backed by Syrian and Iranian military teams have now over 40,000 missiles imbedded in the landscape of Southern Lebanon. Stages of missile interception by the Arrow anti-ballistic Air Defense System. The picture shows a hostile missile trajectory and that of the "Black Sparrow" air-launched target missile used in firing tests. One of the big fears of the Israeli military leadership has been the threat of Iran launching a nuclear multi-warhead ballistic missile at Israel. If it were to hit, all “Jewish history” would be over. Along with the “Iron Dome”, the United States military began deploying up to 100 Israeli personnel per battery, for the “Arrow” long range ballistic missile defense system. In what is described as an “ambitious multi-layered program” to protect Israeli cities from rockets and missiles fired from Lebanon, the Gaza Strip, Syria and Iran, it appears the weak link in the air defense systems is the fact that medium range missiles can still penetrate these defense systems. According to the first drawing and developmental stage of the Israeli Arrow system in 1986, as early as 1995, the Arrow system produced in Israel was expected to become operational. One of the biggest delays has been integrating the Israel system with American components. Today, up to 50% of the Israeli made system was depended on her American suppliers, Boeing and IAI. They in turn used over 150 American companies in 25 states to manufacture the parts. Such is the interweaving of the defense systems of America and Israel and their mutual interdependence in military defense. If the day comes when American fully turns against Israel, her Arrow air defense system will also become a target by America to sabitoge Israel by failure of the U.S. to provide Israel with vital component parts. It was not until 2005 that the first Arrow 2 interceptor was delivered to Israel. Final delivery of the two systems was expected by the end of 2010 – and not too soon. One wonders whether the foot-dragging on the diplomatic front by Netanyahu has been in part to borrow time to get full deployment of their defense systems intact. The first system was deployed in March 2000 at the Palmachim Israeli Airbase near the city of Rishon LeZion south of Tel Aviv. It became operational in the fall 2000 and was working at full capacity in the spring of 2001. The second Arrow battery system was deployed at the Ein Shemer Airfield near the city of Hadera, near Haifa in Northern Israel. In the year of 2007, after the debacle of the 2006 Hizballah War, the IDF began to modify its missile defense system with the growing threat of Iran and Syria aiming barrages of missiles against Israel. The Haifa defense sites were concealed and now Israel is preparing to fund a third missile battery south. Its deployment has been highly secretive, and it is not known whether it is operational at this time. Part of the intense sensitivity is that the Negev Nuclear Research Center is now coming under the threat of the Arab states and a fourth Arrow deployment site is now being considered in the center of Israel. This latter will host the new Arrow II system plus its new radar, “Great Pine”. All in all, Israeli IDF plans to purchase between 50-100 interceptors for each of the four Arrow battery sites, at a 1998 cost of $170 million per battery. One of the reasons that the United States induced Israel to co-produce the Arrow system was that now the United States can prevent Israel from selling the Arrow defense system to other countries without American approval. Countries such as India, Turkey, Britain, Japan, and Netherland were potential customers of the Arrow or the Golden Citron systems. With the operational data and technical highest secret and sensitive component part, the United States can now prevent Israel from selling any abroad but also is not willing to purchase of the Arrow system for American military needs. Such is the high and risky costs of the dependency of Israel upon the United States. With the Arrow II and the new generation Arrow III system, a fully integrated defense shield by the Israeli Rafael Industries with the integration of Israeli Military Industry’s “Iron Dome”, Katyusha and Qassam rockets can now be prevented from direct or collateral damage on Northern Israel territories. The Trophy System will also soon deploy the new Merkava 2, the Merkava 3, and now Merkava 4 tanks. Israel will soon become one of the most protected sites in the world. But will it all work in times of “Trouble”? 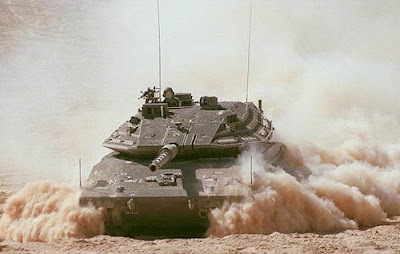 Described by military fans as the “baddest tank” on the block, the impressively designed IDF Merkava 4 (MK4), Israeli designed tank retrofitted the MK4 made by Israeli Rafael Industries with their own Trophy Active Protection System (APS). This tank was designed for crew safety with a survivability door in the rear of the chassis that makes this tank as proclaimed to be a “beautiful crown for this king”. While Israel remains as a world leader in force protection, the emerging technology of the future is futuristic armor to protect the next generation APS to protect light & medium armored vehicles from missiles, RPGs (rocket propelled grenades), missiles, or even tank fired rounds headed for deployment. What is called the “Trophy” System, Raphael Industries are retrofitting not only their Merkava 4 tanks but will also be retrofitting their earlier Merkava 2 and 3 tanks also. The Trophy made worldwide headlines when the world became acquainted with the concept of “virtual shield” that would surround an armored heavy vehicle. It was designed to intercept shaped charge penetrating hand held RPG (rocket propelled grenades) rounds such as the Russian RPG 7 & RPG9 Vampyr, that are now in the hands of terror sponsoring nations and spreading rapidly amongst terrorists & insurgents across the Middle East. These advanced penetrators have taken their toll on both Israeli Armor in Lebanon as well as American vehicles in Iraq and Afghanistan. Next to IED (improved explosive devices) road side bombs, this is the number one threat and killer of US Servicemen in conflict in Afghanistan and Iraq today. .
Of the defensive technology, Israeli Military Industries, has now produced the “Iron Fist” a electronic protective shield to be used on the new IDF “NAMER” (Hebrew for Tiger) Armored Personnel Carrier. It protects tanks and other platforms in the modern battlefield from anti-tank threats such as rocket ammunition by enemy forces, anti-tank guided missiles (ATGM). When it detects incoming missiles or ammunition, one of two counter measures are activated; the “Soft-Kill” as an electronic jamming device that diverts the incoming missile in its trajectory and thus misses its target, or “Hard-Kill” where a blast interceptor explodes near the threat neutralizing its affect upon the threatened tank or armored personnel carrier. The 2006 Hizballah-Lebanon War was a wake-up call by the Israeli military. The air war was not sufficient to neutralize the missiles arriving into Israel and the ground troops were not mobilized quick enough with Israel’s potential “rolling thunder” troops with their Merkava tanks. While the top military brass were in love with their “blue armaments”, they had to return to their senses that “green”, on-the-ground armaments were in. No war could be won without a land based military engagement. While the Israeli Defense leadership was installing protective gear on their military vehicles and tank, the Israel Air Force was also retrofitting their jets as they upgrade their aging F-16s jet by the Israeli military Tefen procurement Plan for modernizing the entire military. The foundation of the Israeli Air Force is the new F-16 Sufa and the F-151 Thunder Israeli modified jets, both Israeli variations of the most advanced USAF F-16/F-15 jet. Not only are they substantially improved but their range for long-distance strikes against enemy forces like Iran have also been significantly extended. Even so the Israeli Air Force is preparing to replace their aging F-16s with the Lockheed-Martin F-35 Lighting II, stealth Joint Strike Fighter Jet and like the rest of the world, Israel is “lusting” to procure the highly expensive F-22 Raptor. Also included are the Israeli specialty UAV (Unmanned Aerial Vehicles) that Israel has become a world leader in this technology of fighter sized pilotless aerial defense wonders that continue Israel’s massive air superiority across the Middle East. Also, the third of the Triad of Defense; Air, Land and Sea, the Israeli Defense Force today has five German built SSK Dolphin class “attack” submarines, as the state of the art and the most advanced in diesel powered submarines in the world. They are named the Dolphin (Sonar adapted sea animal wonder), the Leviathan (biblical sea giant) and the Tkuma (Revival) while two more Dolphins expected in 2009 have yet to be announced as actually being deployed as the silent sea lurkers seeking enemies of G-d’s chosen people. Matthew 16:26 – “For what profit is it to a “nation” if it gains the whole world, but loses its own “national soul”? Destination Yisra’el – “The spiritual and time honored traditions of all Jews are to defend their country from the elements of sacrilege until the Messiah makes everything whole. These traditions run deep and the Israeli Defense Force (IDF) was established within these spiritual concepts. Without a religious Jew, the Land of Israel would never have been colonized. It even took the spiritual tug upon the heart of Sir Edmund Rothschild who dedicated a large part of his wealth to buy land in Palestine for the future settlers in Israel. Yet we must realize that these facts would never have been accomplished except without a tug from the finger of the Divine and a sentimental regard for the history of his forefathers. Even today, both the secular and the religious IDF commanders legitimize their reason for defense of the land of Israel by reminding and inspiring the new recruits of their biblical heroes. Legitimately King David was and is the greatest of the warrior heroes of all ages. Yet, we must not forget our Sumerian forefather, Abraham who with a warring military from his own household rose and in military assault took down an entire coalition of five rulers, including King Nimrod of Old that had captured his nephew Lot from the city of Sodom once nestled in the picturesque Vale of Siddim. In spite of such iconology of the past, the IDF have traditionally held a certain standard of neutrality in a nation of communist, socialist and secular Jews fleeing from pogroms against them, not because of their religious identity but because of their native genetic background that said that “they were Jews”. So today Israel stands on the threshold of a new holocaust. If Iran and all of her allies launch 20,000, 30,000, or 40,000 missiles against Israel, any number of them chemical and or nuclear, the history of Israel will be bleak, and a larger sector of this land will be contaminated for the future. Yet, the prophetic picture negates every one of these scenarios. Yes, there will be launched wars, such as the final GogUMogog War that many scholars equate with Armageddon, when at the end of days the forces of Gog will overwhelm all defensive forces of Israel, yet the G-d of Israel has promised that He will protect His own and the forces of nature will turn against Israel’s enemies. Yet, from all of these prospective scenarios, we are almost there at that final day. “Tribulation” has already arrived. If you have not experienced tribulation's effect, neither will your spiritual eyes clue you to the prophetic highway that is sweeping by in front of your “eyes” for they have been dimmed because you choose to ignore the prophetic reality that the Jews of the House of Judah and the Israelites of the House of Israel are the prime actors in the final Drama of the Ages. In that “Day” in the near future, all the defensive forces to protect Israel will appear to only be in vain; that is until the Jews of Israel come to the prophetic reality that, they must turn their national collective hearts and souls to the G-d of Israel and seek His Divine protection. Until that day, the Prime Ministers of Israel will continue to “negotiate” their countries future with national leaders who seek Israel's demise, desperately trying to find any national friend who will be their benefactor.